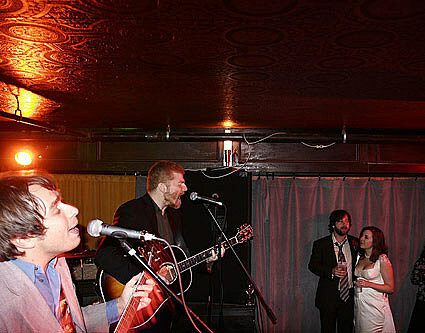 Union Hall can now call itself home to at least two major indie rock weddings, and both weddings involved The New Pornographers‘ Carl Newman, and Union Hall mainstay comedian Eugene Mirman, in one way or another. 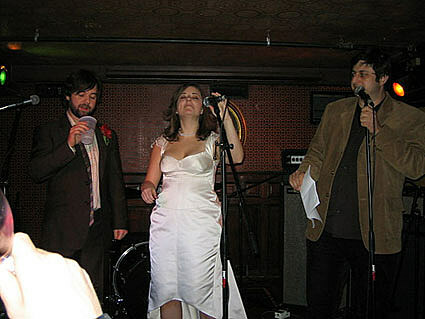 The first wedding (August 4, 2007) WAS Carl Newman’s, and (luckily then) Carl merely played at the second one. Carl and Peter of Peter Bjorn & John did a set of covers at the private Saturday night show that also included sets by Dean & Britta and The Mugs (not the Muggs). Congratulations to Union Hall’s booker Skippy, and his new wife Courtney. More photos like the two in this post, at Flickr. Read an interview with Skippy (Jack McFadden) at Gothamist. For Peter, that meant his third show at Union Hall. His first was with Bjorn and John – their NYC debut back in January, and his second was just one night before the wedding – he was the not-so-secret guest on Friday night’s David Kilgour show…. the real treat was after the night’s show (including David Kilgour and Euros Childs) was supposed to be over. And as if that wasn’t enough, Michael Showalter‘s new comedy album Sandwiches & Cats is out this week. What does that have to do with Union Hall? Well, it was recorded there! Stream it now at AOL. As you probably know by now – mostly thanks to Michael Showalter & Eugene Mirman‘s weekly Sunday night show “Tearing the Veil of Maya“, Union Hall has become – along with UCB and Rififi, one of the best places to catch a show by one of NYC’s many “alt-comedians”. 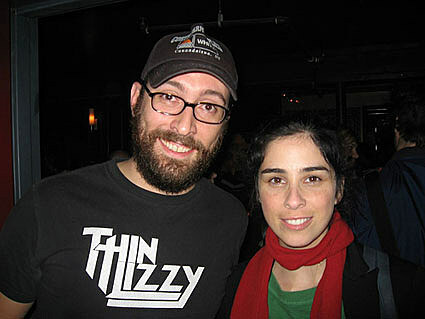 Aziz Ansari, David Cross, Jon Benjamin, Leo Allen…..the list goes on…..
That’s right – Sarah Silverman herself was the the “surprise” at Todd Barry‘s 20th year in comedy celebration at Union Hall earlier this month. Upcoming shows at Union Hall include Daniel Kitson, Travis Morrison, and Oppenheimer. 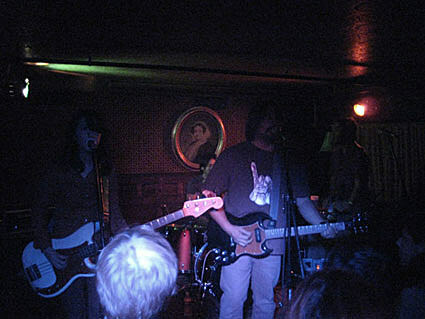 Eugene Mirman & Immaculate Machine played their Sunday night.